Christmas lights are a basic dorm essentials item you want to make sure you have in your dorm room decor. These handy dorm items are versatile and add a lot to your dorm room decorations even though it may seem like you didn't add much. Just because they have the word Christmas in them doesn't mean you're limited to using them at Christmas time! They are versatile, after all! For great looking dorm room decor all year round, add our Micro LED Lights in Green! Our Micro LED Lights in Green feature a delicate strand of micro LED lights. 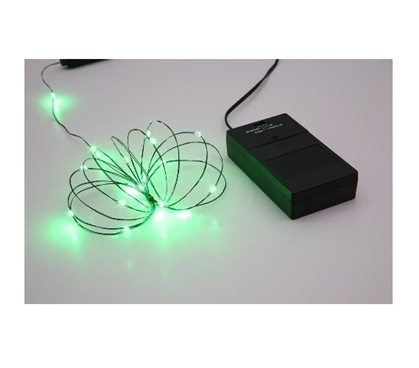 The green color of the LED lights on this delicate strand makes this dorm item perfect for wrapping around a dorm Christmas tree or adding to your dorm room decorations for St. Patrick's Day. You can even use these cute dorm lights in a craft project you found online that you know would be perfect for your dorm room decor. With dorm necessities like our Micro LED Lights in Green in your college supplies, you can really use your imagination and make your dorm room decor even better than it already is. Create a design on your dorm room wall for dorm wall art, wrap around your dorm bookcase or desk, or even place them around your dorm bulletin board for great dorm room decor!